This traditionally styled German quartz cuckoo clock features wooden hands, a wood dial with Roman numerals, and a warm light yellow hand-painted and hand-carved cuckoo bird. 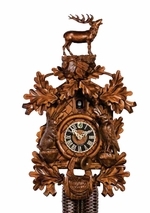 The cuckoo clock case features seven hand-carved maple leaves. Two cast iron pine cone weights are suspended beneath the clock case by two seperate brass chains. The hand-carved pendulum continously swings back and forth. On every hour the cuckoo bird emerges from a swinging door above the clock dial and counts the hour by cuckooing once per hour. (Example: At one o'clock the bird will cuckoo once. At eight o'clock the bird will cuckoo eight times) The half hour is announced with one cuckoo call. Item Weight - 4.5 lbs.